Nicole's Needlework: CaHRH Block Nine Finished! What a beautiful square this one is! All of them are so pretty Nicole and you have gotten just lots done on it! I am so glad that you had fun at Amy's!! I love your new stash too!! I am just elated as my doctor called me yesterday after my stress test and I don't have to go in for the angiogram like I always have before, and also my dh got our other car ready to drive and licensed!! Life is good!! I love watching your progress!! You are really motoring along with CAHRH. It's beautiful. Wow - you are really moving along on CaHRH! Block #9 is beautiful! 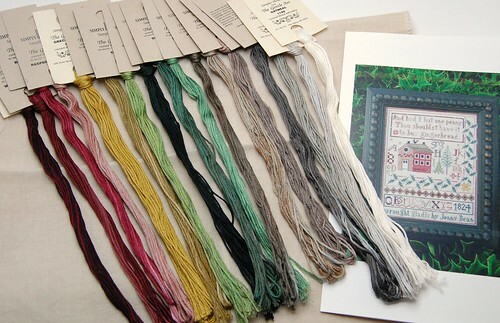 Great stash - looks like a fun Christmas sampler! Another beautiful block finished, Nicol. Love your new stash - beautiful colours. Gorgeous! The church is just lovely! I love the JB Christmas sampler. I just added the Halloween sampler to my stash yesterday and the Christmas one is calling me too! So beautiful! I love seeing your progress! Nice stash too! The colors really are nice. Sigh. Glad you had fun at Amy's! Lovely progress! And I love Jenny's Christmas sampler - I'm trying to finish the Halloween one now and then I plan on getting the Christmas one! It's lovely Nicole. 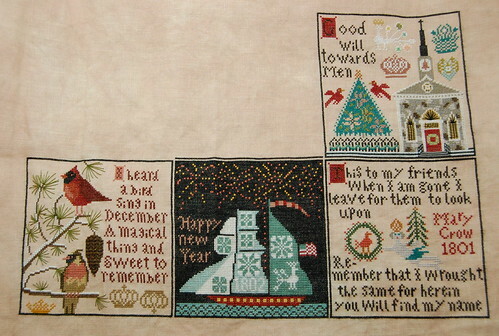 I'm looking forward to seeing your Jenny Christmas sampler all stitched up. Beautiful progress on CaHRH. And your new project looks fun too! Gorgeous Nicole! I love it. 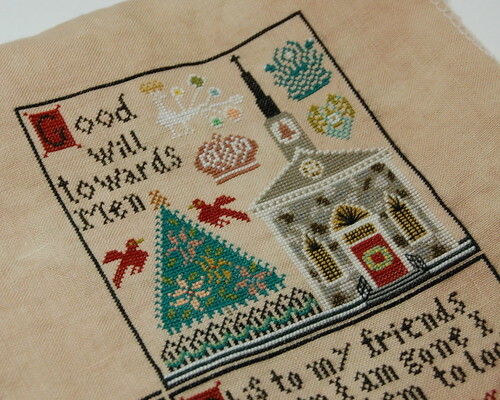 Jenny Bean's Christmas piece is so pretty too, I have it ordered :-). Just gorgeous! It's making me want to try a CAHRH pattern. I love Jenny Bean Christmas! Your Christmas at HRH is wonderful as well! You are getting it done quick! I love CAHRH. It may be my favourite of the lot! You're are just zooming along with it! Looks beautiful! Beautiful progress, Nicole!! Your pictures are so fantastic--so drool worthy. ;) I'm glad you had such a good time at Amy's! Jenny Bean is so cute; I had been admiring it for a little while now. :) Block 9 looks so good, but I'm curious--what is that turquoise motif above the heart at the right of the block? It looks like these seaweed bundles that come in the pack of a certain instant soup we have! I'm really enjoying your progress on CaHRH Nicole! I unpacked that chart at work this week but didn't really have time to look at it. Thanks for sharing! Beautiful, Nicole!! You are really moving on that piece. I just got my chart today! Wow, Nicole, you are moving right along on this one. It's looking gorgeous and what a wonderful job you're doing on it. Great stash too. I want to do the Jenny Bean Halloween sampler. Nicole - you are just speeding thru this one and it is absolutely beautiful! Love your new stash too and that fabric is wonderful!